You’ve been hit by a reckless driver. You report the claim to his insurance company and feel comfortable and encouraged as his adjuster tells you he’ll take care of everything and assures you that you will receive a fair settlement. Days go by; you hear nothing. You call the adjuster and leave messages, still nothing. You wait for an adjuster to contact you to inspect your damage, and nothing happens. At this point, consider having a consultation with a trucking attorney. While each case is different, an attorney may encourage you to mitigate your damages in a number of different ways. Typically, you must try to make your losses as small as possible, even though you were not at fault. 2) Not making contact with you, the claimant, hoping no claim will be presented. 3) Extending a low offer because you are not represented by an attorney. 4) Not returning phone calls, hoping you will give up. 5) Telling you there is no coverage or that the insurance company does not pay downtime without providing a proper explanation. Consider requesting notification from them, in writing, of the policy language showing coverage is excluded. 6) Asking you to provide an unreasonable amount of documentation to support your claim or asking for the documentation in a piecemeal fashion. An adjuster should ask for everything that is needed at one time rather than stringing you along asking for additional information and documentation each time you have provided the previous information requested. 7) Sharing claim information with unauthorized persons, such as comparing and sharing claims notes with agents from different insurance companies. 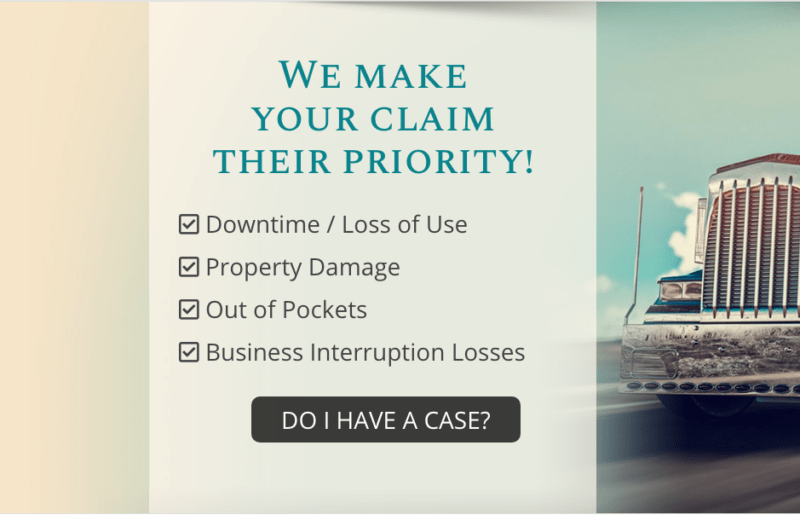 -Refusing to pay your claim without a reasonable investigation to determine liability. The at-fault insured’s statement to his insurance company that he was not at fault is not typically sufficient reason to deny your claim. Interviews should be conducted with all parties and witnesses. All pertinent information should be reviewed and considered without a bias toward denying your claim. 8) Once the investigation has been completed and liability accepted, not moving to timely resolve your claim. If you encounter such challenges, consulting with or hiring an attorney can be to your advantage. At Eckert & Associates, PA, we have many years of experience in dealing with truck accident claims. We frequently partner with transportation professionals who help support trucking claims, including mechanical and financial experts who analyze evidence and provide expert opinions. They can also challenge evidence and testimony of the other party should your case go to suit. Hiring an attorney will help you to avoid potential headaches, such as signing a release of your claim when you don’t understand what you are signing, or by settling your claim for less than it is worth. It doesn’t cost anything to speak to us. Our consultation is free. If you’re not sure what to do after an accident, we can discuss your case and you can determine whether our services would be beneficial to your needs. Feel free to review our web site’s many articles on these related topics and call us if we can be of assistance.